The agency has a bona-fide statutory or administrative requirement for the use of the address which would otherwise be confidential under this chapter. The address will be used only for those statutory and administrative purposes and shall not be publically disseminated. California businesses can play an important role in preventing the exchange and sale of confidential address information. According to Section 6208.1(b)(1) of the Government Code, a Safe at Home participant may make a written demand of a person, business, or association to remove any display of their home address or telephone number from the internet. The California legislature has provided Safe at Home participants with a civil remedy for failure to comply with their demand. However, the Safe at Home program does not monitor or enforce compliance. A ruling (FIN-2009-R003) by the United States Department of Treasury Financial Crimes Enforcement Network or FinCEN, issued on November 3, 2009, allows financial institutions to use an address designated by the Safe at Home Program instead of the confidential residential address of the participant. Schools may have an administrative need to know a program participant's residential address to determine students' district zone, as well as for administrative and emergency purposes. While public schools must keep the program participants residential address confidential, it is further recommended that all schools use the Safe at Home Program participant's designated Safe at Home mailing address on any mailings and public documents. 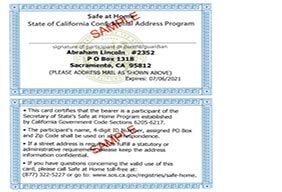 California law requires all local and state government agencies to accept a Safe at Home Program participant's designated mailing address. Law enforcement agencies are not excluded from this rule. Law enforcement agencies are expected to comply with the same statutory obligations as any other state or local government agency. The California legislature, in Government Code Section 6209.5(a), authorizes Safe at Home participants to request that their residential address be replaced on real property deeds, change of ownership forms and deeds of trust with their Safe at Home designated mailing address. The legislature requires California government agencies to comply with the participant's request per Government Code 6207(a)(1) unless certain governmental circumstances apply. While Safe at Home cannot provide legal services or advice in accordance with the above Government Codes, listed below are the links to professional legal services and state and county agencies where Safe at Home participants may seek professional legal advice. The Safe at Home program participant will present his or her Safe at Home laminated Authorization ID card to you. The Authorization ID card will contain the participants name on file with the program, his or her program identification number, the designated mailing address, and an expiration date. Call the Safe at Home program, toll-free, at (877) 322-5227, to confirm the active status of a program participant.